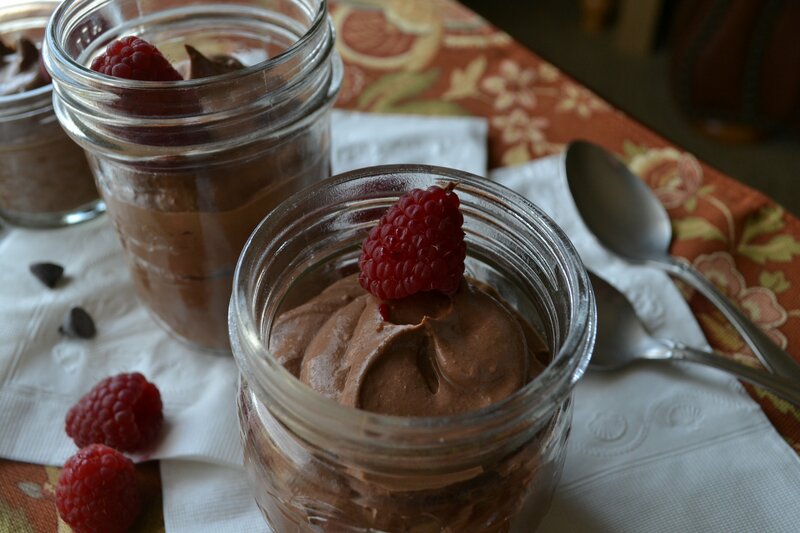 Is there room in the blogosphere for one more vegan chocolate mousse? How about one with massive peanut butter taste? In a food processor, combine the tofu, peanut milk, vanilla extract, cocoa powder, peanut meal, peanut butter, a pinch of salt and sweetener, if desired – and process until nice and smooth and creamy. Meanwhile, gently heat the chocolate chips in the microwave or in a double-boiler on the stove top until melted. Pour the melted chocolate into the food processor and process – again – until everything is silky smooth. Scoop into bowls, cute little jars or one big container. Chill until firm. Pssst: don’t forget to sign up for the Virtual Vegan Potluck! Click here! Is there room?!? Make way, because this one tops them all. So delicious and rich looking. In love! xoxo. Can’t wait for later today! Hey hey there is always room for peanut butter, and mousse. You kidding me? True dat, girl! And if some veggies have to get composted to make room, well, so be it. There is ALWAYS room for more mousse. At least in my book! This looks phenomenal! I will have to make it this weekend! I think you’ll love it :-)! Thanks for stopping by! Okay, I am convinced I would like tofu this way 🙂 It looks incredible!! Yes, there is room! This is a lot like my vegan chocolate mousse, but you added a few things peanuty extra! Great idea! 🙂 Yummmm! Good stuff, dear Annie! Yes, there is room! This is a lot like my vegan chocolate mousse but you added 3 things extra: all peanuty! Good stuff, dear Annie! Not to mention: incrdibly tasty! This is pure delciousness! Chocolate. Peanut butter. COUNT ME IN!!!! Love both, and this sounds divine!! 🙂 Hard to go wrong, right?! Jaw drops, drool commences. I must make this soon. It looks delicious and so light and fluffy, just how a good mousse should be. Haha! There is a difference between mousse and pudding – and this is definitely mousse. OMG the fluff factor on your spoon is making me drool. I need this mousse. I haven’t attempted vegan mousse yet, that must change! Brittany, I confess that when I saw that photo I was way impressed with myself. And then I ate that pudding right off of that spoon! I am knocked out. And now dreaming about sweet things. My pastry chef-ish hubby will be VERY intrigued by this little number my friend. Thank you. You are welcome :-)! Keep me posted! Your mousse looks fantastic!… Nice use of nut meal. I’m always at a loss as to what can be done with mine after making milk. I have a ton of almond meal in my freezer! There is always room for more chocolate mousse!!! I agree — lovely photos! Based on the last comment, I might have the answer to my question: can this be made with almond butter and almond meal? Or, would that change the flavor or texture too much? I think that almond butter/meal would be wonderful! Almond and chocolate…very nice :-). Hehe :-)! We all agree! And thanks! There is always room for another mousse recipe! It looks so fluffy and I love your photo styling! Yhis looks out of control good Annie – wow! Well done! When I saw that second photo I wanted to lick the mousse off the screen! Gorgeous with the raspberries, too, what a tempting looking treat. Seriously girl, peanut and chocolate overload! Wayyyy to much goodness going on here! I need this in my life, ASAP. I’m making almond milk this weekend, so I think I will just use almond pulp/milk, but this is so happening! I think almond would be fantastic. I have tons of almond pulp in my freezer so there may be lots of mousse in my future ;-)! Holy moly! I’ve never tried a vegan choc mousse before and this looks incredible! Like a Peanut Butter Cup but a million times better. Ohh yes this sounds amazing!